Info AUUUUUGH! A giant monster Wario is attacking the city! You gotta stop him! Pest Control is a microgame from WarioWare: Smooth Moves. It appears in the first stage of the game: Wario's and the last stage: Tiny Wario's. 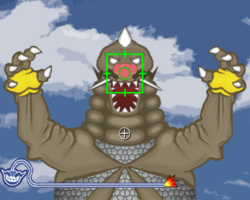 The player must simply shoot the part of the monster's body that the green box is over. It is either over the chest, its right arm, or its left arm. The player must press or to shoot. 1st level difficulty: There is only one green box. 2nd level difficulty: There are two green boxes. 3rd level difficulty: There are three green boxes. This page was last edited on October 2, 2018, at 06:56.